IFA 2017: Acer Switch 7 Black Edition launched, world's first fanless 2-in-1 notebook equipped with discrete graphics. Acer today expanded its popular portfolio of ultraslim convertible/detachable Windows 10 devices with the launch of next generation Switch 7 Black Edition model. The Swift 7 Black Edition features powerful 8th Generation Intel Core processor and more secure biometric technology supporting Windows Hello. The Acer Switch 7 Black Edition is the world's first fanless 2-in-1 notebook equipped with discrete graphics, made possible by Acer's innovative Dual LiquidLoop fanless cooling technology. With a powerful 8th Generation Intel Core i7 processor and NVIDIA GeForce MX150 graphics, it is an ideal companion for intensive tasks, creative production and content streaming. Designed for the mobility minded, the new Switch 7 Black Edition is incredibly versatile, weighing less than 1.15 kg (2.5 lbs.) with the keyboard detached. The Switch 7 Black Edition's slender and lightweight design features a sturdy brushed-aluminum body that offers a robust feel and beautiful tactile touch. 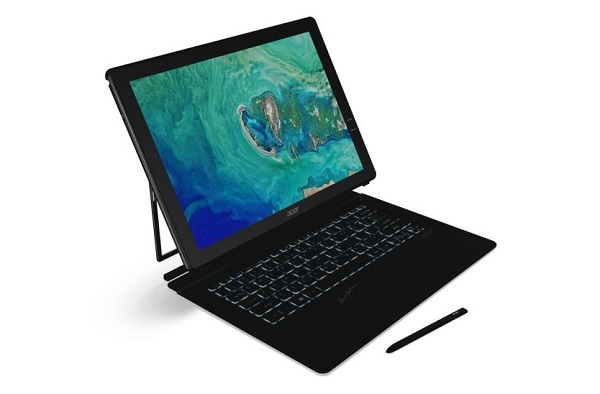 The Switch 7 Black Edition is Acer's first to feature Acer AutoStand, a patented kickstand that can be auto-deployed and auto-retracted, providing single-handed operation as simple as opening and adjusting the display on a clamshell notebook. With a large 13.5-inch IPS display with 2256 x 1504 resolution, the Switch 7 Black Edition offers a crisp, vibrant visual experience from wide viewing angles. The latest reincarnation of the Switch has an embedded stylus powered by Wacom EMR technology that features 4096 levels of pressure sensitivity and pen tilt support to control the angle, width or shading of the stroke. This stylus is now battery-free, and cased in the sleek outer shell designed to provide users with a more authentic writing and sketching experience when using Windows Ink. Supporting Windows Hello, the Swift 7 Black Edition features an optical-based under-glass fingerprint sensor design with POA (Power on Authentication) that allows users to power on the device and login instantly with just one touch. The Acer Switch 7 Black Edition will be available in North America in December with prices starting at $1,699; and in EMEA in December starting at €1,999.